A Family Research Folder is useful before you have done any research. You can use it to plan where you want to go and what you want to find. Once you decide which name, date, or place to double check or find, decide what type of document is needed to validate the information you have or to provide the information you are missing. You may know which documents to look for. Otherwise you will need to find out where to start your search by consulting an experienced researcher, librarian, book or web-site devoted to genealogical research in the specific time period and place you are researching. When you decide which type of document is needed, turn to the Research Log listing the record category where that document belongs. Write down the document you desire and where it might be found. For example, a marriage date and place can be verified by a marriage certificate. 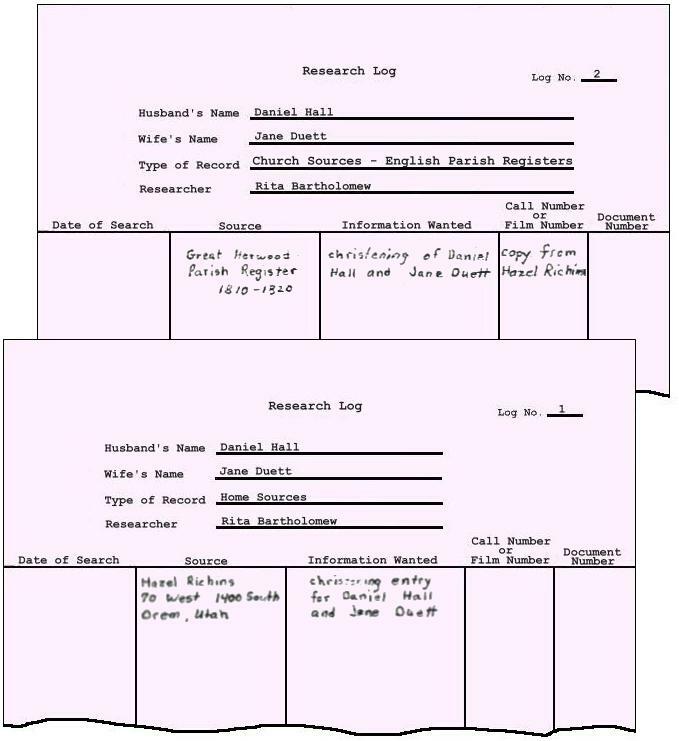 If you have the marriage certificate in your home, turn to the Research Log for “Home Sources” and write down that you want to find the marriage certificate of ______ and ______ (you and your spouse). Then list where it is — a scrap book, third drawer in the bedroom dresser, a box under the bed — or who has it in their possession. Now proceed to another objective — your date of birth. This will probably be verified by a birth certificate. 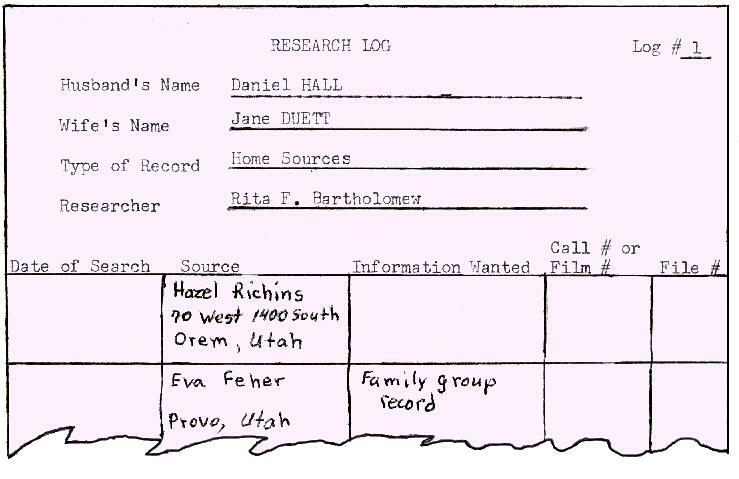 Since a birth certificate is a civil record, you turn to your Research Log labeled “Civil Sources” and write down that you want your birth certificate. The place it is kept is filled in next. This might be at the ____ (state) record office. 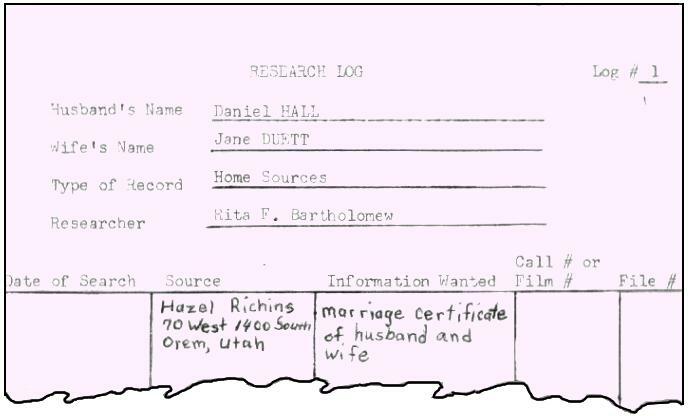 If you already have a copy of this certificate at home, you then turn to the Research Log labeled “Home Sources” and write down that you want your birth certificate and where it is located. This means this information is written down on two Research Logs. If for some reason you don’t have a birth certificate, choose another source that will verify your date of birth and turn to the appropriate Research Log. Then fill it out as described above. Sometimes you may know that someone has plenty of information, but you do not know the nature of the information. In that case just list their name under “Home Sources” and plan to visit them. You need not list the information wanted. Sometimes this will happen when you plan to interview someone. You may want to fill in the “Information Wanted” section after the visit when you know what information is available. When you have finished listing the documents you want to find, the sources you need to search, and the people you need to visit to verify the data on your family group record, it is time to start your search.